Suicide Squad is a film that’s crowded with some of the worst criminals and evildoers the DC universe has to offer. However, what remains a mystery is the identity of the actual antagonist of the film, a.k.a. the threat that the Squad is sent to defeat. 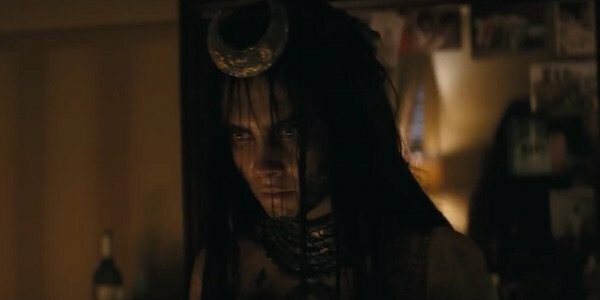 There’s been plenty of speculation on which DC character is dangerous enough to send individuals just as dangerous to stop them, and now a new rumor suggests that the main antagonist will actually be someone previously thought to be one of the film’s "protagonists": Enchantress. Heroic Hollywood heard a rumor that Cara Delevingne’s character will be the adversary that requires the super villain team’s attention in the 2016 blockbuster. Why? Evidently she’s on a mission to find her dead brother and resurrect him. This catches the attention of Amanda Waller, who sends in the Squad to prevent Enchantress, a.k.a. June Moone, from destroying the world. This would be a dramatic departure from Enchantress’ comic book counterpart, who joined the Squad in order to keep the darker side of her personality in check. While this "resurrection" scheme sounds sketchy (and the outlet notes that it’s still unconfirmed, so make of it what you will), there may already be clues that Enchantress doesn’t have close ties with the Suicide Squad in the film. In July’s San Diego Comic-Con preview, we only see her exploring a mysterious cave, laying in water with an etched pentagram looming over her, and a blink-and-you-miss-it shot of her looking particularly frazzled (as seen above). There aren’t any shots of her hanging out with the rest of the team. So, while it remains to be seen if she’s the main antagonist, for now it looks like she’s on her own mission that may put others in danger. Still, we’ll need another trailer before we can draw a more informed conclusion on this particular plot point. Enchantress is only the latest DC character that’s been rumored to go up against the Squad. At the beginning of the year, we heard that Jesse Eisenberg’s Lex Luthor (whose presence in Suicide Squad is still unconfirmed) will be running a superhuman trafficking scheme in the film, and his master plan involves weaponizing Enchantress somehow. Several months later, a rumor came out that the Squad might battle the supervillain Antiphon (a classic Suicide Squad foe from the comics) and his terrorist cell, Onslaught. Whoever this mystery antagonist is, however, they’re dangerous enough for the U.S. government to send a team of killers and psychos after them. We’ll see Enchantress and various other DC villains in action when Suicide Squad hits theaters on August 5, 2016.